Fiat Chrysler Automobiles in Auburn Hills Monday introduced the Dealer Market Investment Program, which seeks to match potential dealers with specific markets where they can succeed, as well as strengthen and enhance FCA’s U.S. dealership network. The program would assist and provide financial support to individuals who want to operate a Chrysler-Dodge-Jeep-Ram or Alfa Romeo-Maserati dealership but have limited funds. “This program places the support of FCA behind high-potential dealer candidates and tells them we have their backs as they enter the retail vehicle sales business,” says Reid Bigland, head of U.S. sales. Candidates must apply and demonstrate leadership skills, financial acumen, and customer satisfaction, as well has have a proven track record of exceptional sales performance. They must also participate in FCA’s dealer assessment and development program and invest their substantial amounts of their own start-up capital. FCA will provide 85 percent of the funds needed to cover the dealership’s working capital with low-interest loans through relationships with Chrysler Capital and Detroit’s Ally Financial, while the potential dealer covers the remaining 15 percent. For the real-estate investment, Chrysler Capital and Ally Financial will provide 80 percent of the funding, FCA will provide 15 percent, and the potential dealer will cover the remaining 5 percent. FCA recently piloted the program at Northland Chrysler-Jeep-Dodge-Ram in Oak Park. Hall and Thomas started making improvements to the dealership immediately. 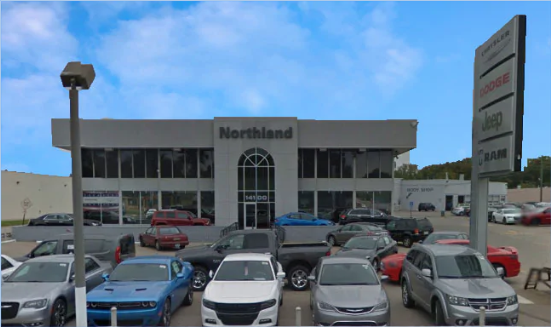 Northland is now the only African American-owned Chrysler-Jeep-Dodge-Ram dealership in metro Detroit. Thomas began his automotive industry career working as a technician at Northland more than 33 years ago.